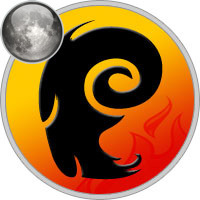 Moon in Aries makes the native tempestuous, courageous and a great lover of personal freedom. He likes to live an independent life and do not care much about other’s views and opinions while making any important decision. People with Moon in Aries sign have a fiery heart that always knows that whatever bad happens, there always a bright sunny day. Such people take few moments to forget, forgive and move on in life. They feel intensely about everything, this keeps them from lingering too long in an emotional mood. People with Moon in Aries are capable to sense the truth of a matter, and can even become restless for others to "get it." Such people are adventurous and always looking for excitement in life. You can see them most alive and happy only when they are at the edge of trying new things and meeting new people. During emotional breakdown they do not meant to harm anyone with their words, but might be brusque at times. Their medicine is often the blinding truth that otherwise would go unsaid. You can trust them in a kind of relationships, as they’ll always put efforts to keep it real, fresh and honest. They’ll need a romantic partner that won’t be easily give up by their bluster. For them making up is the next step to argument, and then the smoldering passion of the Aries will re-emerge. If you can handle getting singed now and again, it’ll likely be an unforgettable time. People with Moon in Aries sign are likely to be spontaneous, excitable and hostile in their arguments. Such people are self-reliant and prone to irritation at times. They do everything for themselves. They are self-disciplined, and cannot be disciplined by others. They will do whatever they like and will not entertain any kind of dominance by anyone. Their friends and relatives will either like them or hate them for their impulsive behaviours. In relationships, there will be no grey shades. It will be either extremes of love or hate. They are fond of leading and taking charge, and will end up in a position of authority in career. Such people are a natural leader and possess the ability to communicate their thoughts with conviction. They live their life in their own pace and terms and thus, choose their own vocation or career. The Moon in Aries relates them with adventures, independence and military life. Succh people may be attracted to the study of the occult, or mysticism. As far as relationship is concerned, people with Moon in the house of Aries share a difficult relationship with their spouse and partners due to their impulsive nature. There would be a lack of sympathy, and communication.